Click here to access the Schedule for the term. 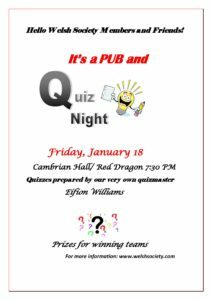 Come along to play pool and have a chat in the Red Dragon. Cyfarfod cyntaf y flwyddyn newydd. The book this month is “Juliet’s Answer” by Glenn Dixon. This will be followed by a Tê Bach (light refreshments). Siarad cymraeg y bore ‘ma. There was a young fellow/maiden or old man/lady from Brecon/Rhyl could be the first line. but boy, lad, girl, gent, woman are also acceptable if they fit the rhythm! A delicious lunch will be provided. Looking forward to seeing you there.